I help you create happier people: we all need to be seen and heard. When I tell people that I coach for wedding speeches, I’m told fantastic stories of where a wedding speaker was memorable for all the wrong reasons. Lately was one where the best man did a powerpoint presentation of the husband’s ex-girlfriends. What was he thinking? He wasn’t: that’s the trouble, and the bride left the room! Don’t allow this to happen to you. If you really want to blow them away, take as much care with your speech as with the rest of the preparations: why leave this wonderful opportunity to chance? Laura (above) measured out all the little things that made her want to marry her man, inspired by a favourite poem; Mike, father-of-the-bride, went from a fairly functional speech to a wonderful (& funny) story from his daughter’s wedding planning experience featuring a famous brand… ‘this wedding comes to you sponsored by…’, you get the gist. 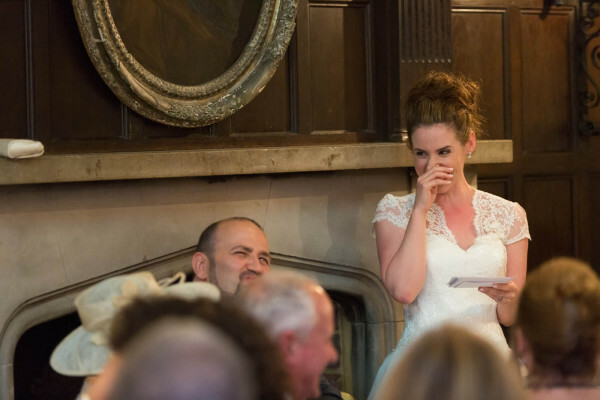 When a wedding speech really works it is natural, considered and heartfelt. Funny will come with ease… you will be able to relax and enjoy it. The speaker connects to everyone in the room and each person will take away a special memory of how that wedding made them feel. This is priceless. Having spoken at my own wedding, I know just what it takes to work with any nerves and create something wonderful: so that even the most reluctant speaker can shine on the day. ” My daughter says in her card that she thought my speech was great and you don’t know how much that means to me. Thank You !! !” Nick C., Father-of-the-Bride.